This Thursday PURPLE is the new black, orange, pink and every other color of the rainbow! The 16th is Spirit Day, a day when wearing purple signifies your support for those who have been bullied in the past and those who are still facing this terrible torment. 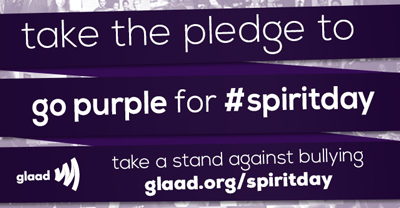 Schools and communities as well as individuals are encouraged to wear purple. Last year even the White House communications went purple for the day. This year “Orange is the New Black” Emmy nominee Laverne Cox will help New York City’s landmark Empire State Building go purple. Now one of the most famous transgender women in the U.S. and beyond, Cox has also appeared on the cover of Time Magazine.